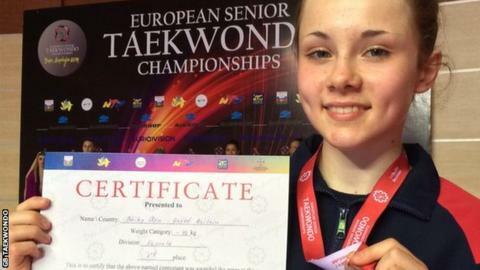 Teenager Asia Bailey won Great Britain's first medal of the European Taekwondo Championships as the Scottish teenager claimed bronze on Thursday. The 16-year-old lost to Ukraine's Iryna Romoldanova in the semi-finals of the -46kg weight division in Azerbaijan. "At first, I was disappointed as I came here for gold," said Bailey. "But now I feel proud of what I've achieved. I felt I got better with each match." She is part of a 14-strong British team that also includes Jade Jones. The Olympic champion from Wales, who came third at both the 2010 and 2012 Euros, competes in the -57kg category on Saturday. Bailey, a 2012 World Junior bronze medallist, had impressed on her way to the semi-finals, beating reigning European champion Ioanna Koutsou of Greece 6-3 in the first round.